The big hypertension, and even nephrology, story of 2015 was the release of the SPRINT trial. The Systolic Blood Pressure Intervention Trial (SPRINT) trial compared an intensive systolic blood pressure (BP) target of 120 mm Hg to a standard target of 140 mm Hg in patients at high cardiovascular risk. It was halted early after interim analyses showed a significant decrease in cardiovascular events and all-cause mortality in the intensive arm. Though there has been fierce discussion of where we go from here given that the prevailing trend of softening BP targets (eg, JNC 2014 recommended a target of 140 mm Hg for most and 150 mm Hg for elderly, ESH/ESC recommended 140 mm Hg for everyone), the early release of SPRINT results has not been accompanied by a similar change in treatment guidelines. The exception is the Canadian Hypertension Education Program (CHEP) guidelines, which are updated annually (see previous blog coverage here). 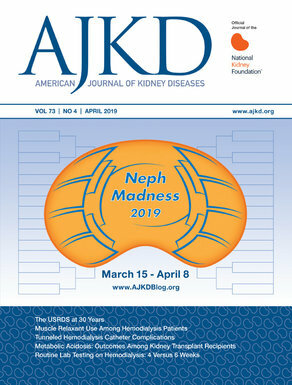 Automated office blood pressure (AOBP), taken without patient-health provider interaction using a fully automated device is the preferred method of measuring in-office BP (see #NephMadness coverage of this topic here). A non-fasting lipid panel is acceptable as part of the routine panels (previously fasting lipids were required). In patients with secondary hypertension arising from primary hyperaldosteronism being considered for potential adrenalectomy, assessment for lateralization should be done using adrenal vein sampling. For high-risk patients, aged ≥50 years, with systolic BP levels ≥ 130 mmHg, intensive management to target a systolic BP ≤ 120 mmHg should be considered. Intensive management should be guided by AOBP. Patient selection for intensive management is recommended and caution should be taken in certain high-risk groups. Clinical or sub-clinical cardiovascular disease. Chronic kidney disease (non-diabetic nephropathy, proteinuria <1 g/d, or estimated glomerular filtration rate 20-59 mL/min/1.73m2). Estimated 10-year global cardiovascular risk >15%. Heart failure (ejection fraction <35%) or recent myocardial infarction (within last 3 months). Indication for, but not currently receiving, a beta-blocker. eGFR < 20 mL/min/1.73 m2. Patient unwilling or unable to adhere to multiple medications. Inability to measure SBP accurately. Known secondary cause(s) of hypertension. The full paper is available here, and details and educational material will soon be available at the Hypertension Canada website. Disclosure: SH is a member of the task force for the Canadian Hypertension Education Programme. The opinions expressed here are that of the author, and do not represent the CHEP guidelines or process.